If you’re a first time reader, welcome! Shell’s recent human rights abuses in Nigeria have come under international scrutiny over the past few weeks as Platform’s new report, Counting the Cost, revealed that the oil giant fuelled recent human rights abuses and government crackdowns in the Niger Delta. The UN Dispatch described the report as a “bombshell”, and praised the global coalition of NGOs behind it. Counting the Cost has achieved amazing media coverage in The Guardian, Reuters, BBC World Service Business and Africa , and UPI. The story was splashed on the front pages of Nigeria’s daily newspapers, (with articles in the Tribune, My Joy, the Nation and This Day ). Media outlets in the Netherlands, Greece, France, Italy, Australia, Canada, Ghana and Bangladesh covered the story. From the morning of Monday 3 October till Sunday night, Twitter lit up with mentions and retweets about Shell fuelling violence and killings in Nigeria. The tide of public pressure your support has generated is already achieving change. By Wednesday 5 October, the House of Representatives, Nigeria’s legislative body ordered an official investigation into the allegations against Shell. As the investigation proceeds, we must keep the pressure on Shell to stop abusing human rights in the Delta. If you missed Shake!’s young people blowing audiences away during their session The Unheard: Youth, the ‘riots’ and the media for Rebellious Media Conference a week or so ago, then here’s another bigger, longer chance. 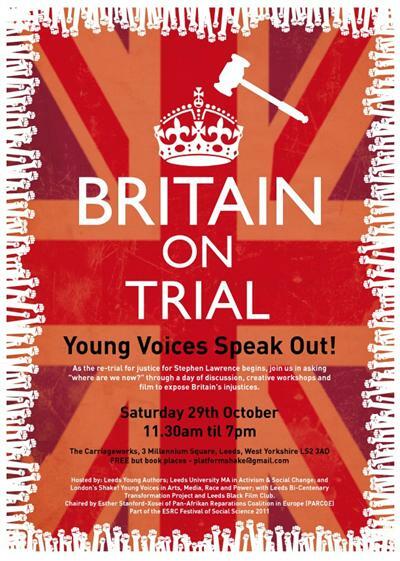 Britain on Trial is an urgent one-day event of mini-lectures, creative workshops and film, set in the context of the new re-trial for justice for Stephen Lawrence, and the summer’s ‘riots’. It’s a chance to work alongside dynamic youth, and committed activists and artists, put together by Leeds Young Authors, Shake!, and Leeds University academics from the MA Activism and Social Change , with collaborators from Leeds Bicentenary Transformation Project, and Leeds Black Film Club. Chaired by outstanding activist and speaker Esther Stanford-Xosei of Pan-Afrikan Reparations Coalition of Europe. Part of the ESRC’s Festival of Social Science 2011. Shake! is presenting at “Get up, Stand Up, Turning Young People into Leaders through the Arts”, Friday, October 28th, 09.00 to 16.00, Bernie Grant Arts Centre, Tottenham. This day of talks and workshops is about ‘building bridges between the worlds of activism, art and politics to make young people the heart of their communities and leaders of positive change’. Get yourselves over there for this great programme: £20/£15 concs, you can book here. ‘Energy Security’ – A toxic frame for progressives? Platform and PIRC are running a day-long workshop on the 4th of November in Machynlleth, Wales on the problems with using ‘energy security’ as a frame in campaigning. The rise of ‘energy security’ within policy discussions has led many civil society organisations to alter the way they talk about climate change and energy. Yet is it a useful way to frame the debate, or does it harbour problems for progressive social change? Is a focus on energy security a means to promoting environmental protection and social justice, or does it in fact justify a very different set of values and policies? See here for more info and how to register. 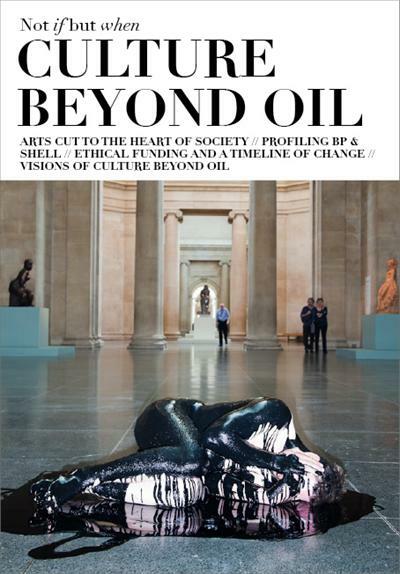 We are currently in the design phase of a glossy, full-colour publication featuring several stunning oil response artworks and bringing together various voices in the debate around oil sponsorship of the arts. Including pieces by Ben Jones and Chris Jordan , and featuring written contributions by Conrad Atkinson, Julian Stallabrass and Cecilia Wee, each of the 1,000 limited edition copies will be individually daubed with crude oil collected from the Alabama coastline by German artist Ruppe Koselleck as part of his Take Over BP series of work. This bookwork is being co-published with Liberate Tate and Art Not Oil. Platform and Liverpool Guild of Students presents a night of free performance poetry, documentary photography and political discussion to launch a new photography exhibition at the Ken Saro Wiwa bar. The exhibition aims to raise awareness of the story of writer and activist Ken Saro Wiwa and the ongoing struggle of the Ogoni people in Nigeria against decades of social and environmental devastation caused by multinational oil companies, in particular Shell, and the Nigerian government, in the oil-rich Niger Delta region. These powerful photographs document the severe impact of oil extraction on the Ogoni people and the local movement for environmental justice. Featuring performances from slam poetry guru Sai Murai and inspiring spoken word artist Khadijah Ibrahiim, presentations from documentary photographer Adrian Arbib, Platform’s Ben Amunwa and trade unionist Clara Osagiede who was a student activist in Nigeria in 1995 under Gen Abacha’s military regime.